Before the UFC debuted, people really had a hard time judging how effective different martial arts were because practitioners of different styles rarely fought each other and there were wild rumors and claims about what different styles could do. You’d hear about people getting knocked out by pressure points strikes and invulnerable fighters with Iron Bell technique and while it sounded far fetched, you had to wonder if MAYBE there was at least SOME truth to some of the claims. While the UFC has changed everything in the United States, things have been slower to evolve in China. That’s how Xu Xiaodong became a sensation in the Chinese martial arts community. He was a MMA fighter who challenges “masters” from traditional martial arts to fights. Most of these masters were older, but people used to believe that these sixty year old masters were still wrecking machines. In China, apparently they still buy into that to a degree. Which brings us back to Xu Xiaodong doing what he does. Xu Xiaodong is back at it. 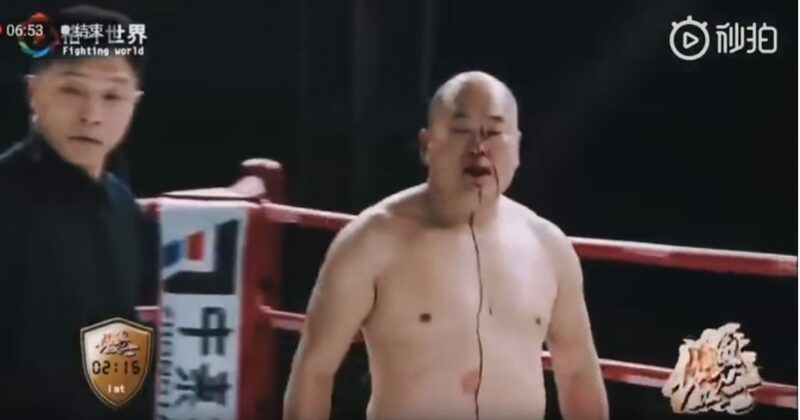 The Beijing based MMA trainer and fighter, whose nickname is ‘Mad Dog’, has started 2019 with another MMA vs. traditional martial arts fight and another brutal stoppage. Xu’s victim this time around is the 56-year-old Tien Ye; a self-proclaimed kung fu master whose name may translate to ‘Wild Fury’ (Chinese names often have multiple translations). * The South China Morning Post reports that Xu vs. Ye went down in a kick-boxing rules match after a Chinese tycoon offered a 30 million yuan ($4.4million) incentive to Ye if he could beat Xu. Ye was reportedly guaranteed 3 million ($440,000) even if he lost. As someone who took Southern Long Fist Kung Fu in college, I am a fan of traditional martial arts. However, what we’ve learned from the UFC is that some of them, like Muay Thai, Boxing, Wrestling, Jiu-Jitsu, Sambo, kickboxing & MMA style training are much more effective than the old, traditional styles. Does that mean those old styles are useless? No, but if you want to learn the BEST styles for self-defense, they’re not the right way to go in 2019.